What is an Exchange Offer? / How does an Exchange Offer work? Exchange offer allows members to exchange items or items for cash with each other. 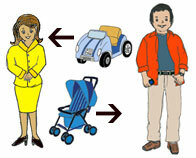 Seller (Annie) lists an item (a stroller) in 'Exchange Offer' or 'Fixed Price Sale / Will consider offers' listing to receive exchange offers from interested members. Annie has specified the estimated price as $100 and fixed shipping & handling charges of $15 in her listing (Total cost: $115). Seller must select types of exchange offers he/she is willing to consider. Seller has the option of specifying what he/she 'Prefers in Exchange'. Potential buyers submit their offers for the listing. An offer thus submitted becomes a pending offer. 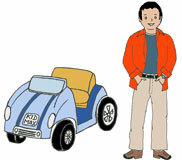 A potential buyer (Bill) submits an exchange offer to Annie's listing with his listing for a power wheels toy. Bill has specified the estimated price as $70 and fixed shipping & handling charges of $20 in his listing (Total cost: $90). He specifies $10 for 'Cash with item' in the offer. This means that if Annie accepts this offer, Bill will send to pay $10 to Annie with the item. Seller and interested buyer(s) can then communicate with each other and negotiate a fair deal. They can send messages to each other and can add/subtract money from the offer. They must keep total cost in mind, including shipping & handling charges, while negotiating an offer. Seller can reject a pending offer anytime. Buyers can also cancel/withdraw their pending offer anytime. Annie thinks $10 is too little for Bill to pay her because it values her item at total cost of $100 ($90 + $10) only. She suggests that Bill add $10 to the offer. After some negotiations, Bill adds $8 to the offer. This means that Bill will send $18 ($10 + $8) to Annie if she accepts the offer. Annie accepts Bill's offer. When Annie accepts Bill's offer, all other offers she might have received will become invalid. If at the time of accepting an offer, the available quantity can not be reconciled with the quantity specified in the offer, the offer becomes invalid and no further action can be taken by the seller or the buyer. After an offer is accepted, trading partners are obligated to complete the transaction. Annie and Bill exchange items and Bill sends $18 to Annie. After receiving the items and payment, they leave positive feedback for each other. This completes the transaction. See Types of Exchange Offer.